It did not take entrepreneurs long following the creation of the internet to begin using the new platform to sell their goods and services. Although there is some debate about the world’s first official online sale – it may have been a pizza or a Sting CD – the growth of online shopping has been explosive. By the end of 2007, e-commerce accounted for about 3.4 percent of total retail sales around the world. Since then, online sales have continued to grow, reaching 10.2 percent of total sales in 2017. Luxury fashion, an industry steeped in tradition, is one sector that has staunchly resisted the allure of e-commerce. However, the industry now appears to be having a change of heart. While online sales still only account for nine percent of the total global personal luxury goods market, a report by consultancy firm Bain & Company found that online luxury sales surged 24 percent in 2017. Consultants at McKinsey, meanwhile, expect online sales of personal luxury goods to more than triple to reach around €74bn by 2025. There are two major draws of buying products online: speed and convenience. These are qualities that, for the luxury industry, have historically been much further down on the list of priorities. Unlike buying a product from Amazon, shopping at Louis Vuitton, Coach or Balenciaga has been perceived as an experience rather than a transaction. Luxury fashion houses aim to provide customers with high-end personalisation and impeccable service to give them a sense of exclusivity and prestige. According to Bain, they are often made to feel like “temples” rather than stores. But now, the main source of the luxury market’s continued growth is coming from Millennials and Generation Z – the so-called digital natives. According to Bain, those born from around 1980 onwards fuelled 85 percent of luxury growth in 2017. Furthermore, according to Bain, a “Millennial state of mind” is filtering through the industry, altering the way all generations make purchases. “This shift also pushes luxury brands to redefine what they deliver to customers, and how they deliver it,” the report said. High earners are increasingly comfortable with making luxury purchases online. 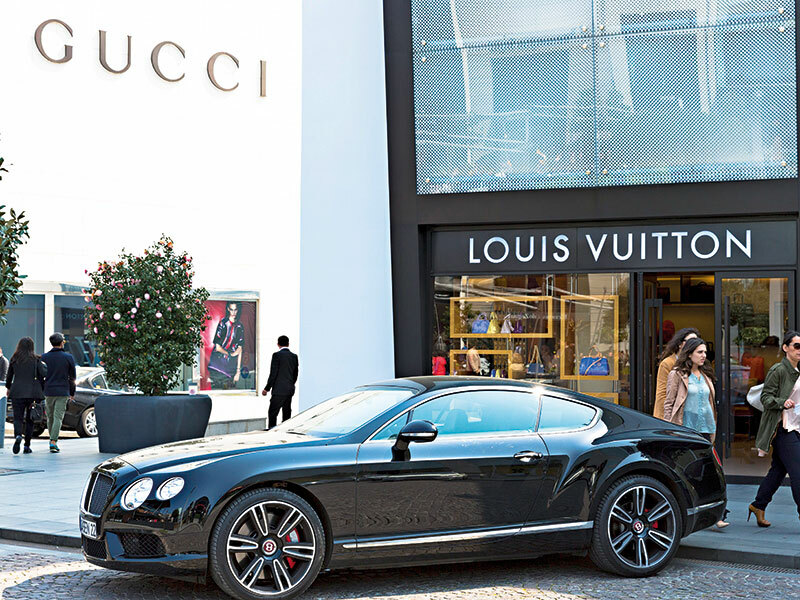 A recent global survey by the Luxury Institute found that 21 percent of respondents preferred to shop for luxury goods online in 2018, up two percentage points from the previous year. While in-store shopping remained the most popular way to purchase luxury items, it fell two percentage points from 2017. “Luxury brands are finally recognising the role of digital channels and online commerce,” Arienti said. In less than five years, she expects a dramatic shift to occur in the industry. Indeed, Bain anticipates online sales of personal luxury goods to make up a quarter of the market by 2025.
brands themselves. Online luxury unicorn Farfetch debuted on the public market in September. On the first day of trading, its share price rocketed by more than 50 percent, giving the firm a market capitalisation of over $6bn (€5.2bn). Shares in the UK-based company have fallen somewhat since then, but it still boasts a multibillion-euro valuation. While this price tag has been deemed outlandish by a number of analysts, it might not be so fantastic. Farfetch helps high-end boutiques sell their wares to a broader audience online. In 2017, the firm generated revenue of $385m (€340m), up 59 percent from the previous year, mostly through commissions on sales through its website. By the end of the year, the company had just under one million active users, up nearly 44 percent from the previous year. Unlike fellow e-tailer Yoox Net-a-Porter (YNAP), however, Farfetch is more than an e-commerce hub for luxury retail, according to Thomas Sineau, an intelligence analyst at CB Insights. In a report ahead of Farfetch’s initial public offering, Sineau explained that Farfetch has positioned itself as more of a tech company disrupting the luxury segment than a pure e-commerce platform. In addition to its online authority, Farfetch has plans for a physical ‘store of the future’ that would include connected clothing racks and interactive holograms. Moreover, Farfetch is making friends in high places. The company has been backed by French luxury brand Chanel and Chinese e-commerce giant JD.com, and has also inked a partnership with Gucci to deliver its clothes and accessories in under 90 minutes in select cities. It has also teamed up with Burberry for a ‘show-to-door’ service that makes runway items available within 24 hours of a show. Traditional luxury companies have been actively investing in other e-commerce firms too. This year, for instance, Richemont agreed to buy the remaining 50 percent of YNAP that it did not already own. YNAP generated revenue of €2.1bn in 2017 and is the largest luxury e-tailer in the world by sales. Despite the prominence of luxury-focused e-tailers such as Farfetch and YNAP, Faccioli said digital giants like Amazon and Alibaba still pose a threat to “everybody who’s not agile, smart or digital”. The luxury industry is often claimed to be an Amazon-proof sector, but if digital titans really put their resources to work in the industry, the results could be game-changing. To beat the competition, luxury brands must stay alert to new trends on both digital and physical fronts. Luxury e-tailers are already working to meet the speed and convenience of Amazon. Alongside Farfetch’s show-to-door service, YNAP has introduced a same-day try-on delivery service. Other new technological products could make waves in the industry as well. Cappasity, for instance, creates a virtual store where customers can explore 3D images of products through a virtual reality headset. Chatbots are another way luxury brands are looking to provide personalised and meaningful feedback to their customers 24 hours a day. Louis Vuitton recently teamed up with mode.ai for a virtual advisor that uses artificial intelligence to meet customer demands. As Farfetch has shown with its ‘store of the future’, the addition of new technologies like augmented reality, virtual reality and smart features could vastly improve the experience of shopping in brick-and-mortar establishments. After years of stagnation, the luxury industry is finally on the cusp of a major transformation. As global e-commerce sales soar higher and higher, luxury brands that continue to resist the digital revolution will no longer be able to cling to claims of exclusivity and high-end status in their stores. Increasingly, unless they adopt new technologies, luxury consumers will see these traditional brands as antiquated, inconvenient and out of touch.